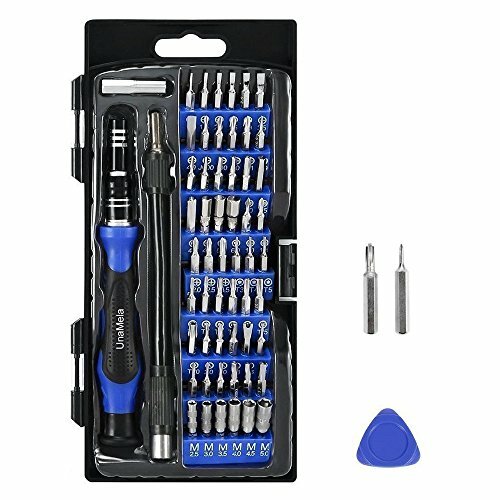 Precision Screwdriver Set with 56 Magnetic Driver Kits,61 in 1 Screwdriver Tool Set,with Flexible Shaft,Opener,Professional Repair for PS4/Computer/iPhone 8/Smartphone/Laptop/Xbox/Tablets/Camera/Toy by UnaMela at Tobby News. MPN: UMT0014. Hurry! Limited time offer. Offer valid only while supplies last. Professional tools 56 bit driver kit: multi-type precision driver bits & CRV sockets meet various purpose and application for repairing, such as Macbook, cell phone,PC,electronic cigarette,game console.2 Special Bits (Y0.6 and CRV 2.5) for iPhone7/8 tail and internal screws. Extenion Bar and Flexible Shaft:Extenion bar extend length from the handle lock-open design ,which basically lengthening to 9 inches. It's great when you need to take out the screw in deep area.The flexible shaft can be bent freely for the screw in the hard-to-reach area, which is really suitable for the screw not on the surface of Large electronic equipment. Anti-Silp handle: The handle with a ball bearing mounted swivel top,comforms to ergonomics design and has an anti-slip function to make work more easily. Driver Adapter and Paddles: The driver adapter allows your electric screw machine to be connected with 56 magnetic bits.The Triangle Opener helps you open various screens. It greatly reduces the work intensity and make work efficiency. High Quailty and Portable Repair Tools:All bits are made of supreme chrome-vanadium steel, and specifically heat-treated .The flexible extension is made of high plastically material, which has elasticity and not easy to be broken.The tool kit with perfect weight and compact is designed for convenient carry. If you have any questions about this product by UnaMela, contact us by completing and submitting the form below. If you are looking for a specif part number, please include it with your message.